Love this crispy pizza base. 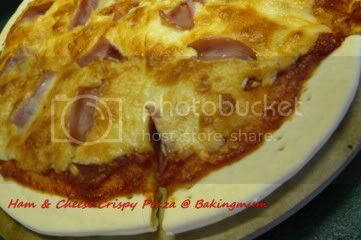 It's very thin, the crust at the side is crispy and most important the ingredients are really simple. Just yeast, water, flour and salt. 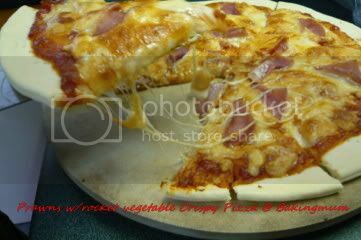 Just made the ham and cheese pizza for the boys and made a prawns with rocket vegetable for my domestic helper and myself. Very yummy. I love this one. Simple and nice. 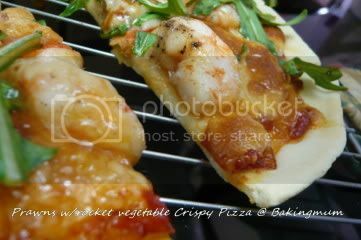 What I did was just mix the prawns with some salt and black pepper before putting it on the pizza dough to be baked. 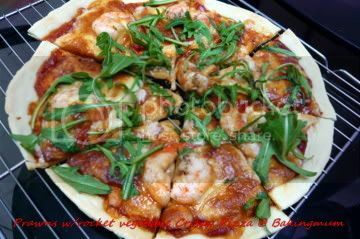 After it baking, throw some rocket vegetable on it and cut it to serve. Ooo... yummy pizza. Has been a long time since I've made some. 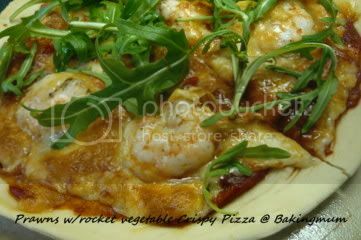 I love the combination of rocket & prawns. This crispy pizza sounds & looks very good. Will definitely be trying it very soon.